When your pet is injured or sick, you want to know right away what’s wrong and how you can fix it. At Animal Clinic of Woodruff, we have in-house digital x-ray equipment available for all our clients in Woodruff, Spartanburg, Roebuck, and beyond. We can perform x-rays on your pets right in our office, and we can see and evaluate the results almost immediately. With in-house equipment, you won’t have to transfer your injured or sick pet to various veterinary offices, or wait days for your results. Reduced travel and quick answers can mean faster healing for your cats and dogs. 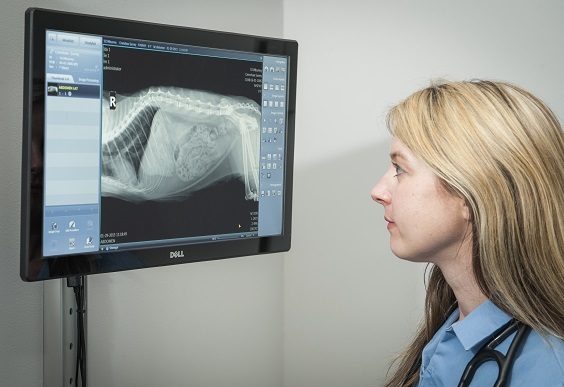 Our digital x-ray equipment also is useful in confirming pregnancy in dogs and cats, and in diagnosing internal conditions. If your pet’s injury or condition requires more extensive diagnosis or treatment, our veterinarian can refer you to a board-certified radiologist, internal medicine specialist, or orthopedic surgeon for procedures such as ultrasounds, CTs, and MRIs. Please contact Dr. Walden or call 864.576.9800 if you need to discuss a complicated case or further treatment for your pets.